It saddens me to no end that more people haven’t figured this out yet. But a food processor is your kitchen’s best kept secret. You might think it’s just like any old blender or chopper, but that couldn’t be further from the truth. The food processor is an absolute miracle machine that makes preparing meals so much quicker and easier. You can even get small ones nowadays if you feel like your kitchen is already a little bit too packed with appliances. So, to give you an idea of its vast capabilities, I’m going to run you through 7 completely different, completely unrelated recipes. You might be in for a surprise or two! High in protein and fiber, these granola bars are the perfect healthy snack that you can take with you wherever you go. So firstly, if you’re familiar with how to use a food processor, you’ll know it’s too main settings are ‘on’ and ‘pulse’. Start by pulsing ½ cup of peanuts and 2 cups of dried apricots together until they’re cut into small chunks. Then add 2 cups of rolled oats, 2 cups of flax seeds, 1 cup of peanut butter, ½ cup of honey and 1 teaspoon of vanilla extract. There’s no more processing necessary before it goes into the pan, but first add another ¼ cup of chopped peanuts and 2 cups of brown cereal rice. Press the mixture onto a pan lined with wax or parchment paper, and then freeze it for 1 hour. Finally, cut it up into individual bars and store in the fridge for later use. 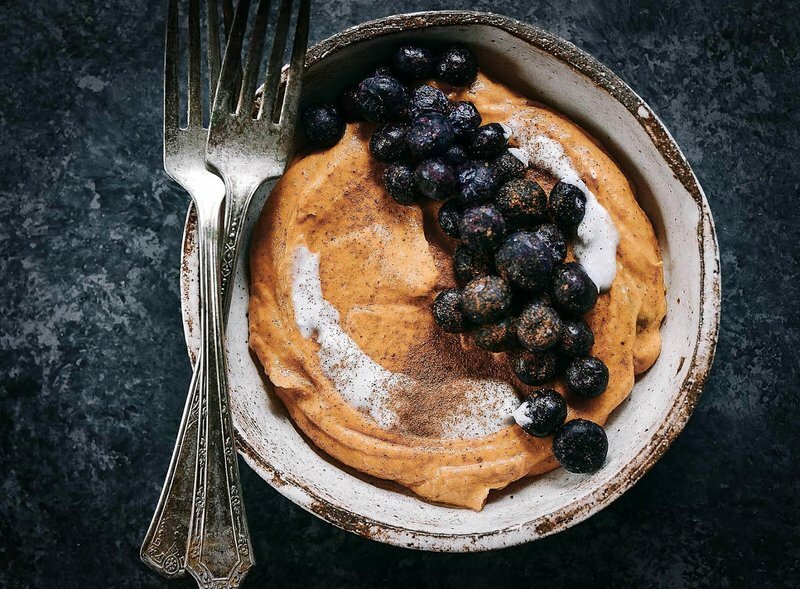 For an easy to make, healthy, and extremely tasty breakfast, why not give this Sweet Potato Breakfast Bowl a try? A favourite in the Paleo diet, this bowl might seem pretty unconventional, but it’s rich in healthy fats and proteins. One of the great things about it is that there’s very few ingredients. All you need is 1 large, cooked sweet potato, 3 teaspoons of almond butter and 3 teaspoons of almond milk. Just get all of these ingredients together in the food processor and let it process until it’s a nice, smooth blend. A good blender may be able to achieve the same result, but on account of its numerous other uses I’d personally recommend the food processor. If you’d like a little extra on this dish, some nice toppings would be blueberries or cinnamon. So to start with, you’ll need 2 ½ cups of all-purpose flour and just a teaspoon of salt. Get those together in the food processor and pulse until they’re combined. Chuck a cup of butter in there too and pulse until it looks like a coarse meal with butter chunks visible. Get ½ cup of water and mix it with vinegar. Then while the mixture is pulsing in the machine, drizzle in the vinegar mixture. Then continue pulsing until the mixture would only barely hold together when squeezed. Naturally, don’t do the squeeze test too much or you’ll end up with crumbly mess of un-chilled dough chunks. And I’m assuming that’s not what you want. Halve the dough and place each half onto a plastic wrap before pressing them into disc shapes. Then just wrap the discs up and chill them for two hours. This mixture will be enough to make two 9-10” single base pies. So that’s Thanksgiving covered! The bulk of the job for this delicious dessert is going to be done by the food processor, but the bananas need a bit of preparation first. Heat 2 tablespoons of coconut oil in a skillet and then add 3 bananas and cook until they’re caramelized around the edges, but still mostly firm. Turn them every once in a while during this and add brown sugar and salt to coat the bananas. Transfer the bananas to a baking sheet and freeze them for about three hours. After that, take them out of the freezer and let them soften for a minute or two so you can break them into clumps. Pulse the bananas in the food processor until you’ve got a smooth paste and then add ¼ cup of coconut cream. Let it pulse until it’s smooth and creamy and then add the final ingredient of another ¼ cup of almond butter. Let this pulse until it’s all combined. By this stage, it will probably look pretty appetizing. So contain yourself from tucking in and place the mixture in an airtight container in the freezer for about three hours. After that you can throw pretty much any topping you can think of on there! Similar to the nice cream above, you’ll need the oven for this dish too. But again, most of the legwork will be done by the food processor. Also despite the name, you won’t need any animated rodent to help you either so don’t panic about that! First thing you have to do is equip your food processor with the slicing disc. Use this to slice 2 red onions, 1 red pepper, 1 green pepper and 3 cloves of garlic. Heat a tablespoon of oil in a saucepan and then add the freshly sliced vegetables. You can also add 2 bay leaves and a tablespoon each of oregano and thyme. Cook this mixture in the saucepan for about 10 minutes, just until the veggies are soft and then add 2 tins of tomatoes. During those 10 minutes, use your food processor to slice up 2 courgettes and 1 small aubergine. Place the courgettes and aubergine into an ovenproof tin and then mix in the rest of the ingredients. Put this concoction into an oven that’s been pre-heated to 160°C and bake for one hour. After this you could add some kind of sauce if you wanted. Perhaps even one that you made yourself with your trusty food processor. Although it might not look like it, you can easily prepare both this cake and the icing on top of it in the food processor. I wasn’t lying when I said it was a miracle machine. Firstly, pre-heat your oven to 160°C and line the bottom of your pan with parchment paper. Use the pulse function of your processor to chop 400 grams of peeled, roughly cut carrots and 1 cup of pecans. Add 1 cup of brown sugar, 1 cup of granulated sugar, 225 grams of all-purpose flour,½ cup of vegetable oil, ¼ cup of Greek yoghurt and 2 eggs to the mixture. If you’re still with me, add a tablespoon each of baking powder, baking soda and ground cinnamon. Process this new mixture until everything is combined. Get everything into the pan you’ve prepared and then bake for about 45 minutes. You’re going to have to let it cool down before you frost it, so while all of that’s going on, let’s get that frosting ready. You’ll need a tablespoon of lemon juice, ⅓ cup of confectioner’s sugar, ¼ cup of fresh ricotta and 250 grams of chopped and softened cream cheese. Combine them in the processor and let it process until it’s a nice, smooth blend. Once the cake is cooled, spread the frosting over it and you’re done. Bet you didn’t think carrot cake could be so easy did you? Bread? Made in a food processor? Seriously?! Yep. There is no limit to the food processor’s capabilities and naan bread is one of its surprises that no one is expecting. Add 2 cups of all-purpose flour and a teaspoon of salt to the food processor and then pulse until the salt is blended in. Add a ½ cup mixture of water, yeast and salt to the processor while it’s blending. Then add a mixture of oil and a beaten egg in similar fashion until the dough starts to come apart at the sides. Turn out this mixture and knead it on a floured surface before placing in a bowl that’s been oiled with cooking spray. Cover this in plastic and leave it somewhere warm until it rises. Then roll out the dough and divide it up. Roll each piece into a circle and then cook them individually in a oiled skillet. Flipping them when they turn brown on one side. And there you have it. Homemade Naan Bread. You never thought you’d see the day. The food processor is a machine that everyone should be making use of on a regular basis because as you can see, you have a whole host of recipes to choose from. And these few that I’ve shown you here are barely even scratching the surface. Older PostWhat's the Best Food Processor for Making Nut Butter?